Greater Exodus has closed on a 99-year ground lease with Fairmont Limited Partnership that paves the way for the development of the JBJ Soul Homes located along the Fairmount and Ridge Avenue Corridors bordering the Spring Garden and Francisville neighborhoods of North Central Philadelphia. 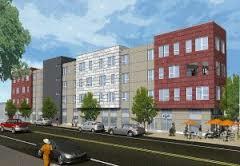 The project, which broke ground on October 3, 2012, will include commercial storefronts to be located on the first floor of the building along Ridge and Fairmount Avenues and Ridge Avenue and Fifteenth Street, attracting people to walk down the corridor into the heart of Francisville. The JBJ SOUL Homes will be a new construction, four-story, approximately 75,391 square foot facility, comprised of 47 efficiency apartments, eight one-bedroom apartments, approximately 5,500 square feet of commercial office space and approximately 12,000 square feet of retail space, which can be used by a single large tenant unit or subdivided for up to three tenants. The commercial space will house Project H.O.M.E. administrative offices for 30 new staff and will be used for high end Project HOME functions. The retail commercial space will be managed by People For People, Inc., a community development corporation. Love and Long, L.L.P. represented Greater Exodus in negotiating the terms of the ground lease and in closing the transaction.